I could tell early on that working with Nichole and Nicholas would be a treat. Christmas comes a little early for me when a bride asks if we can spend most of the day shooting outdoors in Lake Tahoe. Capturing photos of some of the sweetest moments of a couple’s life against a backdrop of stunning mountaintop creation is precisely my cup of tea. For me, this was mixing business and pleasure. For these two lovebirds, this was their wedding day and it was going to be an adventure. New home. New jobs. Even a new car. Because when it rains, it pours. The past few months had been full of life change for Nichole and Nicholas, and they had handled it all with grace. Their wedding day was the next and biggest piece of this series of transitions. They knew they wanted to make this occasion something special by setting it away from home, there in the blue jewel of the West Coast: Lake Tahoe. 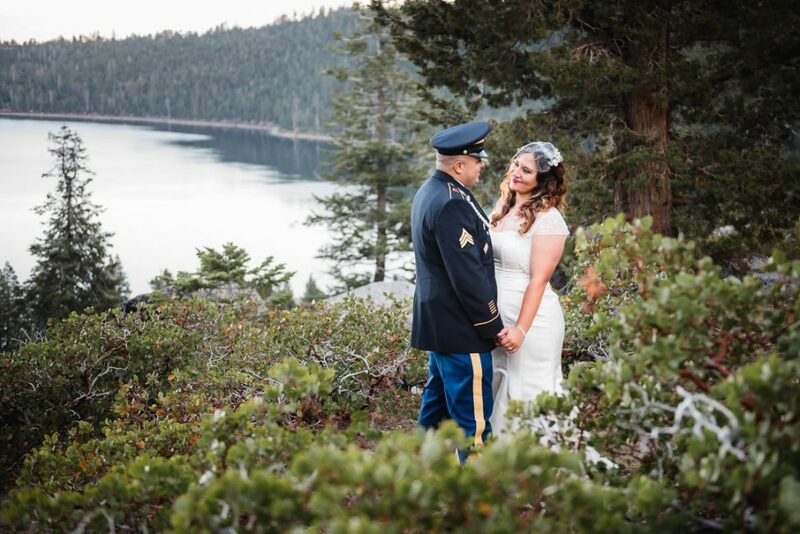 So loved ones and a certain photographer made the drive up the Sierra Nevada mountain range to the Rodeway Inn Chapel in Lake Tahoe. When I arrived and met our heroes, they were calm, collected, and dressed to the nines: Nichole in her dress and Army Veteran Nicholas in his full uniform. Their easygoing demeanor and their joy was clear. It set the emotional thermostat for the rest of our day that we would spend with friends and family, as well as the flora and fauna of beautiful Lake Tahoe. From wooded hikes, to hornet stings, to broken umbrellas, to scenic vistas, to walks on the beach, well…check out some images from the adventure yourself! They started the day by getting signatures out of the way. Nichole’s son was on hand to witness the proceedings. Waiting for his lady just before the ceremony. She showed up right on time, radiant and ready to make a new life with this man. That’s the proud Papa watching from the left. Their mission statement for marriage? She does. And so does he. Proud Papa and his little girl. They go well together, don’t you think? If only you could find rings like these in nature. She loves a man in uniform. This one, in particular. Now out in the woods, Nichole took a minute to reapply. Thankfully, Nick was on hand to hold stuff. Tugging on his heart-strings, or whatever other strings she could find. Trust me, this kiss was even more epic than the one in the chapel. 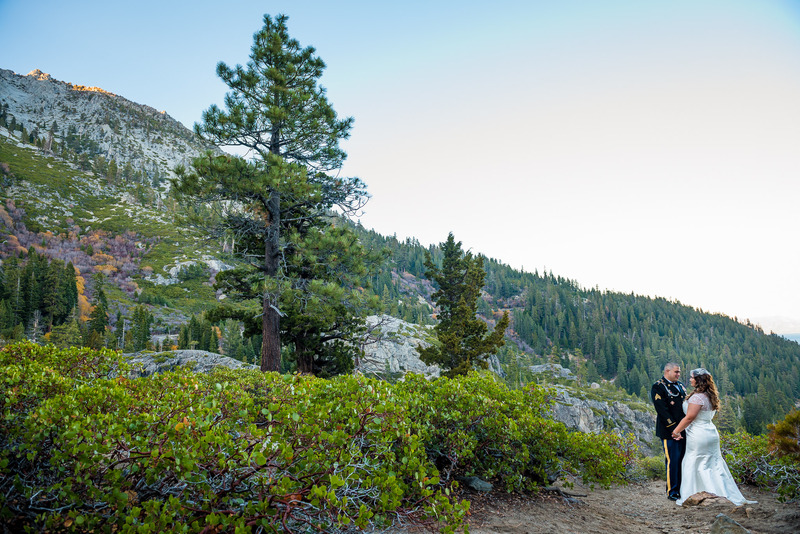 Lovely: the Bride and the Sierra Nevada forest that framed her. Not the typical umbrella shot, and still plenty cute. Quite the gentleman, and quite the dip. Walking the trail to Eagle Falls. Pausing for a kiss alongside Eagle Falls. Enjoying each other above Lake Tahoe’s tranquil Emerald Bay. Climbing walls to reach her. Sometimes the frames are naturally provided for us photographers. Did I mention that our adventure involved a bit of drive time? The sun had gone down and the November chill had set in. But we were determined to get some shots are the shores of Lake Tahoe. Proof that yes, you can take walks on the beach on your wedding night. Long after the sun had fallen, this adventurous couple was up for more. I figured that we’d need to feed the Bride and Groom at some point, so we wrapped up our evening at the South Lake Tahoe strip. From the waters and woods of Lake Tahoe, to the bright lights of the casinos–they’d seen it all on their Big Day. Congratulations to you, Nichole and Nicholas, as you journey on into your adventure as husband and wife. I pray that you find many years of love and peace as you travel together. And thank you for inviting me along for one unforgettable wedding day! If you need a photographer to chronicle your wedding day adventures on and off the trail, check out our wedding photography packages and get in touch! I’m so glad you like the story. Keep on living it! Thanks for letting me in on the fun!